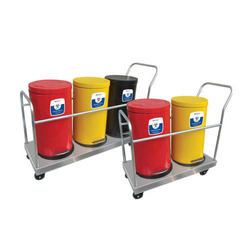 Manufacturer of a wide range of products which include medical waste container. Our reputation in the market is largely judged in rendering the world-class array of Medical Waste Containers. They are easy to use. Foot operating system for the touch-less opening of the lid. Stainless Steel Bins Powder coated for Colour coding. Plastic Inner Bins with handle for Hygiene Easy cleaning. 22 Ltrs Capacity of each bin. Bins can be interchanged as and when required. Available in One Bin, Two Bins, Three Bins Four Bins Trolley Options.